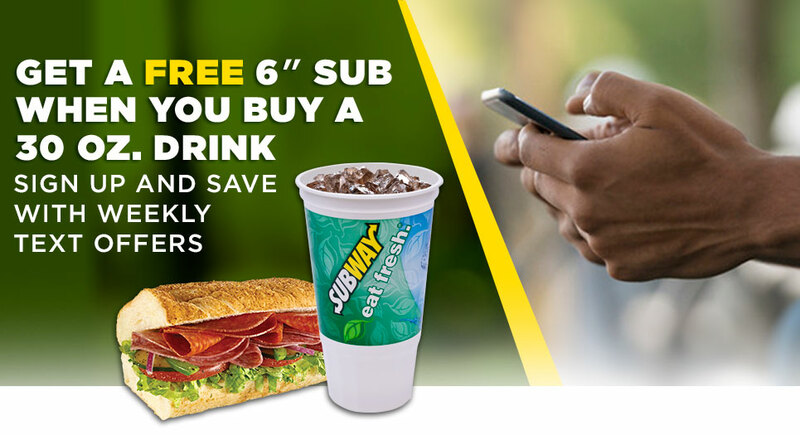 Savvy Spending: Subway: Sign up for weekly deals via text and get a FREE 6 in sub with purchase of a drink! Subway: Sign up for weekly deals via text and get a FREE 6 in sub with purchase of a drink! UPDATE: This appears to still be available, if you haven't done so yet! Sign up for Subway Text messages and get a coupon for a FREE 6 in sub with the purchase of a 30 oz. drink! Just text OFFERS to 782929 to receive weekly deals via text!